What do some high-end golf clubs and your living room window have in common? The answer is glass, but in the golf clubs' case it's a specialized glass product, called metallic glass, with the ability to be bent considerably and spring back into its original form. Your windows, as you know, aren't quite as forgiving of a sudden impact, and they shatter -- they are brittle, as opposed to ductile, or more flexible products. For the golf clubs, however, a new generation of flexible metallic glass puts more bounce back into a golf ball, from the metallic glass' high elasticity. They're not unbreakable, but close. And scientists are working toward even stronger and more elastic glass types which would fail in a ductile fashion instead of shattering. "In glass, localized plastic deformation usually leads to immediate failure," said Seth Imhoff, a Los Alamos National Laboratory materials scientist. "Normally, metal alloys freeze into a collection of crystals in which the atoms line up into very specific patterns. In specially designed metal alloys an amorphous, or random atom arrangement, can be retained in the solid, which can allow us to tailor a wide range of properties such as the ability to be bent severely and spring back into place." And for scientists, tweaking the shearing characteristics of materials such as glass has important applications well beyond the sporting world, it's a matter of broader impact, aiding such fields as space science, electrical transformers, cell phone cases, and yes, golf clubs, because their mechanical and magnetic properties are highly adjustable. An international team of scientists from the University of Wisconsin-Madison, Los Alamos National Laboratory, Universitat Autònoma de Barcelona in Spain, and Tohoku University in Japan are hoping their discoveries will lead to glass that can be both stronger and more ductile. The way that metallic glass deforms plastically is by the formation of what are called shear bands. Shear banding can occur on a macroscopic scale in granular materials, like during an avalanche or landslide, but in glass the bands are generally 10-20 nanometers wide (~3000 times thinner than a human hair!). In their paper "Nucleation of Shear Bands in Amorphous Alloys" published this week in the Proceedings of the National Academy of Sciences, these researchers are looking at the initiation of shear-banding events in order to better understand how to control the mechanical properties of these materials. Once a shear band is formed it travels very quickly across the material and can lead to failure. Therefore the strength is ultimately controlled by how and when they form; so shear banding is termed a "nucleation controlled event." The end goal is to understand this shear band nucleation, or initial formation, behavior so that better properties can be designed. 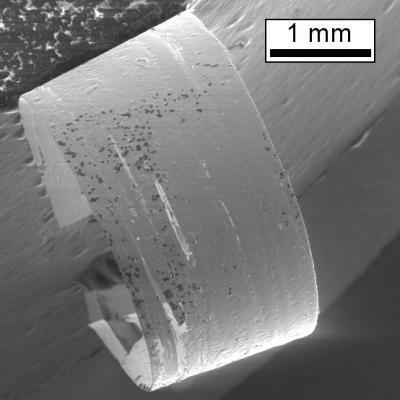 "We've used an experimental technique called nanoindentation to repeatedly sample the initial formation of shear bands," said Imhoff. "Nanoindentation essentially uses a tiny needle with a very precise shape to push on the surface of a sample in a very controlled way. Even though the force is very small, the tiny tip of the needle concentrates the stress in a very small region until a single shear band is generated in order to relieve some of that stress." By repeating this process many times scientists sample many local atomic arrangements and their specific critical stress levels. The new experimental evidence provided in this work challenges the current assumption of only a single type of initiation site, or STZ (shear transformation zone). Identification of multiple types of STZs could lead to new opportunities for controlling the strength and ductility of bulk metallic glasses… oh, and of course this means more durable high-performance golf clubs. Funding: Research funded in part by the National Science Foundation (DMR-1005334) and Office of Naval Research (N00014-12-1-0569). Additional funding from Grants-in-Aid-S, Global COE for Materials Science, and World Premier International Research Center Initiative for Atoms, Molecules and Materials, the Ministry of Education, Culture, Sports and Science, Japan.